he Leicester City owner's helicopter has crashed in a car park outside the club's ground, shortly after taking off following a match. One witness said he saw Leicester's goalkeeper Kasper Schmeichel run out towards the crashed helicopter. Mr Srivaddhanaprabha was at the game and spoke to BBC commentator Ian Stringer on his way to the executive box before the match. One Leicester season ticker holder, who did not wish to be named, said: "I saw Kasper Schmeichel run out first [from the stadium] and then loads of security guards and stewards. "I was stood outside the ground but it crashed on the other side. I hope everyone is OK. In the early hours of Sunday, Leicestershire Fire and Rescue Service's Assistant Chief Fire Officer Andrew Brodie tweeted that he had just left "multiagency strategic meetings" at Leicestershire Police's HQ. He described the crash as "clearly serious and tragic", adding: "Please don't speculate on cause or who may be involved. Think of families, friends, responders, and @LCFC and their fans." 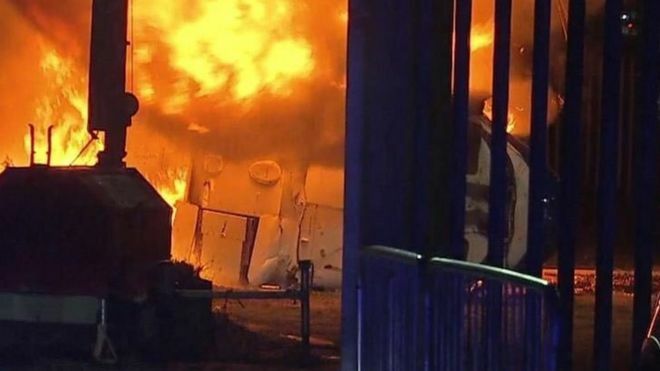 Leicestershire Police said officers were working alongside the other emergency services, the Air Accident Investigation Branch (AAIB) and Leicester City FC to establish the circumstances of the collision. In the early hours of Sunday the force tweeted that the AAIB, which said it had sent a team to the King Power stadium, was leading the investigation. The chairman looked at me today on the way to the executive box and said "hello and good afternoon". We were keeping a close eye on him because of the nature of today's game and it is really eerie around Leicester at the minute this evening. Mr Srivaddhanaprabha bought the club in 2010 for £39m. After Leicester were promoted from the Championship in 2014, said he would spend £180m to get them into European competition in three years. Leicester City then went on to win the Premier League title in one of the greatest sporting stories of all time, and reached the quarter finals of the UEFA Champions League in 2017. Sky Sources: @LCFC vice-chairman Aiyawatt Srivaddhanaprabha and Director of Football Jon Rudkin were not on board helicopter at time of crash. Leicestershire Police Statement: "Emergency services are currently dealing with an incident at the King Power Stadium, in Leicester, after an aircraft came down in a car park behind the ground earlier this evening."